I'm flaky. Personality, skin...but my scalp most of all. I have seborrheic dermatitis. My immune system kinda hates my skin in general. My scalp is harder to treat than most of the rest of it because of my hair, which is fine but fairly dense. Dandruff shampoo helps a little, along with treatments like Scalpacin and tea tree oil, but this year it wasn't enough. The Northeast is having a horrendous spring allergy season because of the unusually cold winter. Even some people who are usually fine are getting the sniffles. Severely allergic people like me are miserable, congested, wheezy, itchy messes. My scalp was infuriatingly itchy and the seborrheic buildup was getting out of control. I swear Nichole reads my mind sometimes. Right after I started investigating shampoo bushes, she posted about one! Since she liked hers, I decided it was time for me to try one too. I went for one that's A) not pink, B) more klutz-friendly, and C) from a brand I know. 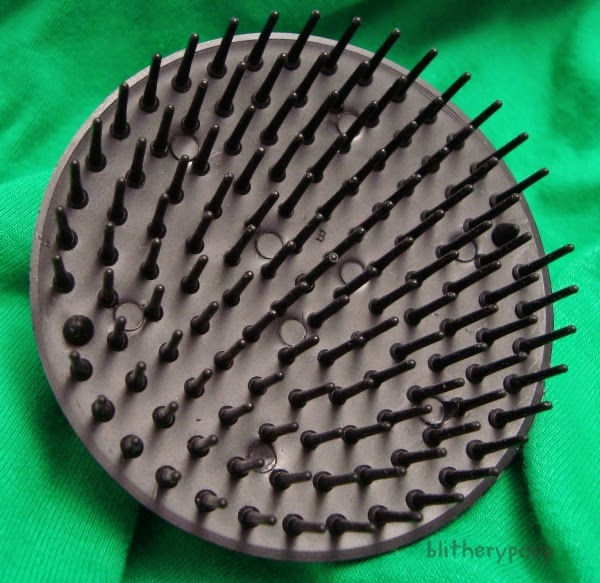 This is the Denman Be-Bop Shampoo Massage Brush. That handle was a huge selling point for me. Nichole's brush has a knobby handle and I just know I'd drop something like that. 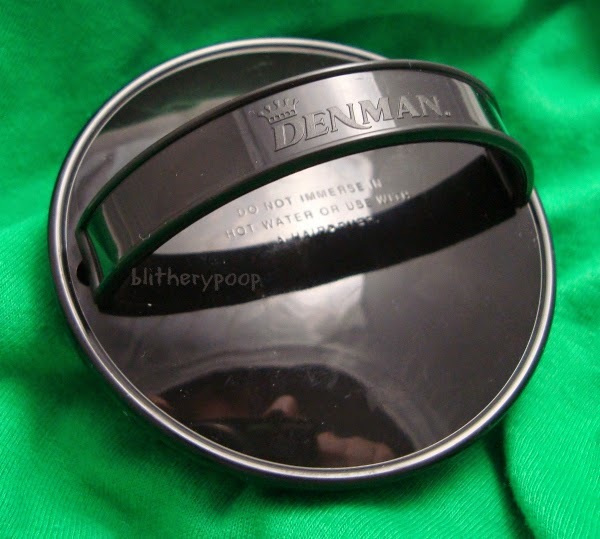 The Denman's handle goes over a few fingers and my thumb and pinkie fit along the edges. This keeps the brush against my palm in a way that makes it almost impossible to drop and very easy to use. Another thing in its favor was the brand. I have one of their large paddle brushes and I love it! I paid more for the Be-Bop than Nichole did for her brush. I got a pack of two for around $7, I think. I bought them to meet the $35 minimum for free Amazon shipping. I also liked the size and density of the pins. Nichole's brush looks more gentle, but the Denman looked like it might handle my buildup better. I didn't describe it at the top, since it's kinda gross. It's beyond just flakes. If you're easily grossed out, don't read this next bit. Seborrheic dermatitis is also known as "cradle cap". It causes lumpy, oily, weird-smelling patches of dead skin that cling almost like scabs. Above my ears and near the nape of my neck are the worst for me, but it happens in little spots all over. It's nasty. It sheds onto my clothes as dandruff too, but that's hardly the worst part of it. The itch and discomfort don't brush off like dandruff does. Before I cared about my nails, I used to give my scalp a good rub every few showers and that helped a bit. Now I'm too worried about breaking a nail while they're wet and soft, so the buildup had been getting worse and worse. Ick. Ok, the gross part's over. Sorry about that. You can see why I was so desperate for something to help with this problem. I've been using the Be-Bop for about six weeks now, every time I wash my hair. It's really made a difference! I itched like CRAZY after first use, worse than before, but I stuck with it. I think the removal of all of that buildup left my scalp a little raw the first time. Since then it seems to be healing overall and the itching hasn't been anywhere near as bad. I do still have tiny spots of buildup between shampooings, but nothing even close to what I had before. There's less dandruff too. I like this thing! I mentioned before that I bought it partly for the shape of the handle. I'd read reviews that warned the handle was weak, but I haven't had trouble with it. It really is easy to hold and stays comfortably on my hand even if it snags slightly in my hair sometimes. 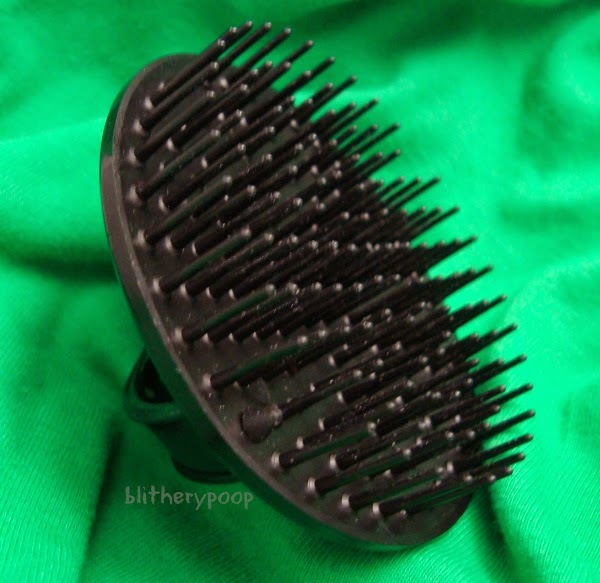 I brush my hair out completely before showering, but the Be-Bop still gets stuck here and there. Nichole didn't have any tangling issues, but her hair is short enough that she can draw her brush through to the ends. The ends of my hair are at the tops of my thighs, so there's no chance of that for me. The first few times I used this brush I wound up with a line of tangles near my shoulders. I've gotten used to it since and I'm not sure what I'm doing differently, but I don't have that problem anymore. The difference it's made for my scalp is impressive. The thin bristles aren't the gentlest things, but they lift the buildup like I'd hoped. They also leave my scalp pleasantly tingly and my hair clean right to the roots. It's way better than washing with just my hands. I have to watch out for the small scar on the back of my head though. (I whacked into a radiator when I was two.) If I brush over it, it gets sore...but I can hardly blame the brush for that. I'd recommend it, especially if you also have seborrheic dermatitis. I worried after that first use, but since then it's helped so much. My scalp is better now than it's been in years. If I'd gotten oozing or scabs, I'd have stopped using it, but it was just tender and itchy. It seems to be just firm enough to remove the gunk without hurting the skin.